12'x16'x11' Summer Ridge. Includes a handsome porch with storage area overhead, nine-lite or 15-lite steel-clad double French doors, architectural shingles, window, under-the-eve vents with enclosed soffits, ridge vent, and half oval vent. Optional items are shutters, window box, and lattice. 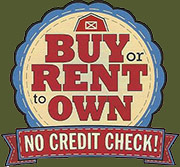 NOTE: This is not a Rent-to-Own building. Normally $4/sq. ft. Call now to save! Leveling: Leveling up to 12" is included. Support System: Building will be supported by 3 each 4"x4" pressure treated runners. Runners are centered on concrete blocks. Floor Joists: Pressure treated 2"x6" joists spaced 12" apart . Flooring: 3/4" Pressure treated plywood. Studs: Number 2 white wood spaced on 16" centers. Top and Bottom Plates: Number 2 white wood. Double top plates. Ceiling Rafters: Birdsmouth rafters to form true overhang. 2"x6" white wood spaced on 24" centers. Exterior Siding: LP Smartside, primed; (vinyl or fiber-cement options). Porch: 4'x12' porch with 3/4" pressure treated floor attached to 2"x6" joists spaced 12" on center. Includes safety balusters, rail, and steps. Roofing: 7/16" 4'x8' sheets of OSB, the industrial standard. True Overhang: 7-9" overhang with enclosed soffits and vents. Fascia Board: 1"x6" white wood all sides. Shingles: CertainTeed Traditional shingles, the professional choice. Shingles are warranted for 25 years. Roofing Shingle COLORS. Felt Paper: Roofing felt paper is included under shingles. Trim Boards: 1"x4" primed white wood. Window: 32"x36" vinyl tilt-down, double insulated window. Shutters and window box shown ARE NOT INCLUDED. Ventilation: Under-the-eve vents, ridge vent, and half oval vent. Loft storage: 4' over porch. pressure treated floor; and loft storage over porch. Note: These sizes already include 4' porch.